Untitled Document Below is a list of notable IDP free agent defensive linemen for 2013. This list will be continually updated throughout the off-season to reflect various changes in the free agency market. I will pull news from Rotoworld as it develops for each player and also add my own comments to these briefs. Now, onto the list of 2013 Notable Free Agent Defensive Linemen. Free Agent Analysis: Dumervil has established himself as one of the best leverage pass rushers in the game. He's one of the few 4-3 ends capable of putting up 15+ sacks in a year, but until he improves his play against the run, he will remain on the fringes of the elite DL1 group. His experience as a 3-4 OLB has sparked interest from teams such as the Ravens and Steelers. Let's home he signs somewhere like Miami or re-signs in Denver. Fantasy Impact of Signing: The Broncos loss is the Ravens gain. Dumervil will now join forces with Terrell Suggs to form one of the most formidable pass-rushing duos in the league. Judging by the fact that Rotoworld has both Dumervil and Suggs listed as linebackers, most league management systems will likely eventually follow suit and do the same. With this said, their fantasy values are probably going to take a dive once these changes take effect. DL1-/LB4+ value moving forward. March 20 News Update: League sources tell the Baltimore Sun the Broncos' "preference" is to re-sign free agent Elvis Dumervil, even though they've scheduled visits with Dwight Freeney and John Abraham. March 17 News Update: The Denver Post reports it's "unclear" if the Broncos and free agent DE Elvis Dumervil are interested in a new deal. Fantasy Impact of Franchise Tag: Johnson enjoyed a breakout campaign in 2012 with 11.5 sacks. He's surrounded by other elite young talents in Geno Atkins and Carlos Dunlap and should be primed for another solid season. Consider him a DL2+ with upside. Fantasy Impact of Re-signing: Spencer will move from OLB to DE in Monte Kiffin's newly installed 4-3, Tampa 2 style defense. He had a career year last season, but has spent his entire career as a standup pass rusher. His progression as a "hand in the dirt" pass rusher will need to be watched closely this preseason. If he can adjust quickly, the surrounding talent and scheme are right for him to put up DL2/DL2+ numbers. Free Agent Analysis: Although his numbers dipped a bit last year, Avril will still be one of the most coveted free agent IDPs. He has the ability to play as a 4-3 edge rusher or 3-4 OLB and is at a ripe age for peak production. As fantasy owners, let's hope he lands somewhere he will play the majority of his snaps at defensive end. Fantasy Impact of Signing: The Seahawks came in late and managed to steal away one of the more coveted free agent pass rushers. This was one of the best landing spots for his fantasy value as he's a great fit as the "Leo" in the Seahawks defensive scheme. Double digit sacks should be imminent. Free Agent Analysis: Bennett graded out quite well last year and is deserving of a nice contract. He doesn't seem to be a priority signing for Tampa Bay, but he will find enough suitors on the open market to be a full-time starter. He should be in line for DL3 value. Fantasy Impact of Signing: Bennett was another great signing for the Seahawks. It's not an ideal landing spot for him fantasy-wise, however. He will likely split time with Bruce Irvin and may lose more snaps later in the season when/if Chris Clemons returns from injury. He's a DL4+ for the time being until we figure out the rotation. March 11 News Update: Updating a previous item, Profootballtalk.com reports that free agent DE Michael Bennett will not give the Bucs a chance to match any offer he gets. Free Agent Analysis: Even at age 35, there are still few players in the league that can get to the QB like Abraham. Granted, he's not an every down player anymore, but he can still bring value to a team in need of a situational pass rusher. If he lands in a spot like Seattle, there's a decent chance he stays in the big play upside DL3 tier. May 11 News Update: Coach Mike Munchak says the Titans are staying in touch with free agent John Abraham. April 12 News Update: The Dolphins aren't ruling out signing free agent John Abraham, but haven't "pursued him recently after initial conversations." March 20 News Update: Free agent John Abraham will visit the Broncos on Thursday. March 16 News Update: Free agent DE John Abraham showed up at the Dolphins' facility last week, but may have never met with club officials. March 9 News Update: A tweet from free agent John Abraham late Saturday indicated that he's returned home after club-facility visits to the 49ers and Seahawks. Free Agent Analysis: Umenyiora has had a decent career so far, but he's been quite sporadic from year-to-year and has been an off-the-field distraction for the Giants. He's on the wrong side of 30 and there's a chance he could land as a third defensive end somewhere. If he does manage to find a starting gig, he should be drafted in the 25-35 range at his position. Fantasy Impact of Signing: Umenyiora landed in a fortuitous fantasy spot. He'll be starting at RDE for the Falcons opposite Kroy Biermann. He'll get to play half of his games on turf and should have the benefit of having good-sized leads in a handful of games. As long as he stays motivated, I think he can attain DL2- status. March 20 News Update: Free agent Osi Umenyiora visited the Falcons on Wednesday. March 18 News Update: Per USA Today's Mike Garafolo, the Lions and Dolphins have expressed interest in free agent Osi Umenyiora. March 9 News Update: According to Profootballtalk.com, the Falcons are believed to be "keenly interested" in free agent DEs Osi Umenyiora and Dwight Freeney. Free Agent Analysis: Freeney was miscast in the Colts new 3-4 scheme and it showed as he only managed to amass 12 total tackles and 5 sacks in 14 games. With this said, he's likely to land back with a 4-3 team as a defensive end, but he just doesn't make enough tackles to warrant draft consideration except in leagues that reward quite heavily for sacks. March 20 News Update: Free agent Dwight Freeney will visit the Broncos on Wednesday. March 12 News Update: According to ProFootballTalk.com, Peyton Manning "wants" free agent DE Dwight Freeney in Denver. Fantasy Impact of Re-signing: I was personally hoping that Hayes would sign elsewhere. He has the talent to be a fairly good fantasy starter, but he won't get that chance in St. Louis unless Robert Quinn or Chris Long suffer a season long injury. He remains a DL4. Free Agent Analysis: Jones played sporadically in 2012 as he missed several games due to injury. He's never lit up the box scores, but he's scheme-versatile and will therefore draw interest from several teams. If he winds up in Detroit, he could provide sneaky value as he's likely be a near every down player (between being an end on early downs and sliding inside for nickel snaps) and will operate under former defensive coordinator Jim Schwartz. Fantasy Impact of Signing: Detroit was one of the best landing spots for Jones. He will most likely play LDE on early downs and slide inside to tackle inside on 3rd down. He could have some sneaky value in this scheme. I wouldn't made taking a chance on him as my 4th DL in deep leagues. March 12 News Update: Free agent DL Jason Jones will visit the Lions. March 11 News Update: CBS Sports' Jason La Canfora reports DL Jason Jones "appears to be at the top" of the Lions' free-agent wish list. Free Agent Analysis: I've been sitting, waiting, wishing for Jackson to break out but it just hasn't happened yet. In all fairness, he really hasn't gotten a shot to prove himself. The Lions don't seem overly interested in re-signing him as KVB's replacement, but he seems willing to sign on the cheap which may increase his chances of returning. He's a player to keep an eye on. March 8 News Update: Free agent DE Lawrence Jackson hasn't "had a whole lot of dialogue" with the Lions as the signing period approaches. Fantasy Impact of Signing: Jackson was met with a cold free agency market and ended up signing a one year deal with the Vikings where he will be a situational pass rusher behind Jared Allen, Brian Robison, and Everson Griffen. It's a smart add for Minnesota, but it diminishes whatever fantasy value Jackson had left. Free Agent Analysis: The other "Dez" Bryant has blossomed into one of this year's better sleeper free agents. He has the versatility to play inside or outside and is a commanding presence against both the run and pass. He apparently has several teams that are interested in his services. For fantasy purposes, let's hope he lands in a 3-technique role. Fantasy Impact of Re-signing: Cleveland pulls off a bit of a shocker with this signing. I like it though. He should prove to be a good fit for Ray Horton's scheme. He's a similar body type to Calais Campbell and may prove to be one of the more valuable 3-4 defensive ends. For those in very deep competitive leagues, Bryant is a player to target late in drafts. March 11 News Update: Yahoo's Jason Cole reports the Patriots, 49ers, Eagles, Seahawks, and Jaguars are all showing interest in free agent DL Desmond Bryant. Fantasy Impact of Re-signing: Melton lived up to his fantasy projections last season. Although 42 total tackles and 5 sacks isn't mind blowing, it was still good enough to finish as a top 15 DT in a lot of leagues (despite missing 2 games). His value will be similar to last year and should be drafted as a DT2. Free Agent Analysis: All in all, Seymour was a bust for the Raiders considering the amount of money he was paid. However, he's still a top 15 DT at a very valuable position. His experience and versatility will appeal enough to a team to draw a short term deal. He's not much to look at anymore fantasy-wise however, except in deeper DT-required leagues. May 7 News Update: Free agent DL Richard Seymour "definitely" wants to play this season. March 13 News Update: Yahoo's Jason Cole reports free agent DL Richard Seymour will probably only play football in 2013 "if he gets paid a lot." Fantasy Impact of Franchise Tag: I'm honestly a little surprised the Dolphins used their franchise tag on Starks. He's a solid tackle, but he has quite a bit of tread worn off his tires and was a bit of a liability against the run last season. However, the Dolphins are loaded with cash right now and solid defensive tackles are hard to find. The release of Karlos Dansby and Kevin Burnett may signal a scheme change which would have trickle down effects for Starks. More than likely, he's a guy to leave on the waiver wire in most leagues at this point. Free Agent Analysis: After showing DL2+ potential in 2010, Shaughnessy's momentum has sputtered. He graded out near the bottom in pass rushing effectiveness last year and with the Raiders fairly cap-strapped and other higher priority free agents to sign, Shaughnessy will likely find himself somewhere else in 2013. My guess is he will land in a reserve role. If that the case, back to the waiver wire fodder pile he goes. Fantasy Impact of Signing: Shaughnessy will likely be a part-time player to start coming in as an end in passing situations with Darnell Dockett bumping inside. If he plays well, there is definitely room for increased snap counts. He's a player to monitor during the early part of the season. March 14 News Update: Free agent DE Matt Shaughnessy will visit the Titans on Friday. Are there any other 2013 Free Agent Defensive Linemen that you think should be included in this conversation? 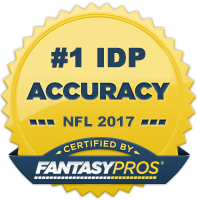 If so, please let me know by posting a comment below or emailing me at theidpguru@idpguru.com. You can also hit me up on Twitter.